By utilising our global supply chain we are able to supply genuine heat transfer plates for all types of plate heat exchanger. Combined with the holding of extensive stocks this enables us to keep prices competitive and keep lead times to a minimum. Non-genuine plates are also available for some models if required. A plate heat exchanger is designed to give the best thermal efficiency, with a specific combination of high and low theta heat transfer plates. In most heat exchangers this type of heat transfer plate is identified by a chevron pattern with an obtuse angle. This pattern creates a higher amount of turbulence and in turn heat transfer, unfortunately the pressure drop is also increased. 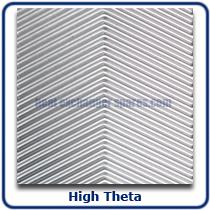 In most heat exchangers this type of heat transfer plate is identified by a chevron pattern with an acute angle. 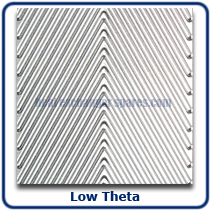 This pattern creates a lower amount of turbulence and in turn heat transfer but the pressure drop is also reduced. When a heat exchanger is designed for a specific duty, the computer programme calculates the best heat transfer plate arrangement, to give the best heat transfer within the pressure drop constraints. 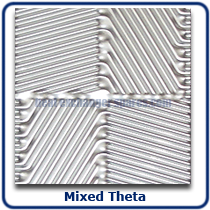 The plate arrangement could be all high theta plates, all low theta plates or a mix of both high and low plates which creates a medium theta pattern. Every plate heat exchanger is different so to maintain the correct duty it is very important that the same theta plates are used and are installed in the correct order. Each plate heat exchanger is supplied with a plate configuration sheet which contains all the relevant information for ordering spare parts and rebuilding the plate pack. Before being returned to the customer, every heat exchanger plate pack serviced by Heatexchangerspares.com is arranged in the correct order, ready for installation by on site engineers. This is the lowest cost heat transfer plate material. It has a low corrosion resistance and is usually only available in a thickness of 0.4mm. This type of heat transfer plate is typically used on HVAC applications. This is the most common heat transfer plate material and is used in many applications. 316 stainless steel has a high corrosion resistance and is typically available in thicknesses from 0.5mm up to 0.8mm. This has a very high resistance to chemical attack including most acids, chlorides and chlorine chemicals. Titanium is usually available in thicknesses from 0.4mm up to 0.6mm. Other materials, such as Hastelloy and SMO, are available on request for special applications. These plates consist of two thin heat transfer plates which are welded together around the ports, creating an air gap between them which acts as a safety barrier if plate failure occurs, as the fluid in the failed channel will leak to atmosphere, giving a visible indication of failure and avoiding fluid cross-contamination. 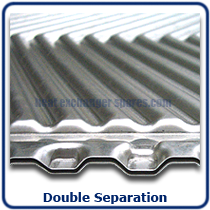 Double Wall typical applications include.